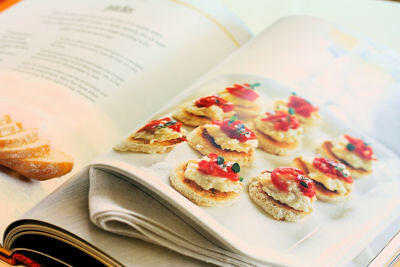 Foodies will do almost anything for love cookbooks. Our shelves are overflowing with ones we have bought, scrounged and borrowed. I was recently sent some to review, it's quite exciting getting an advance copy to peruse before it gets to the shops. 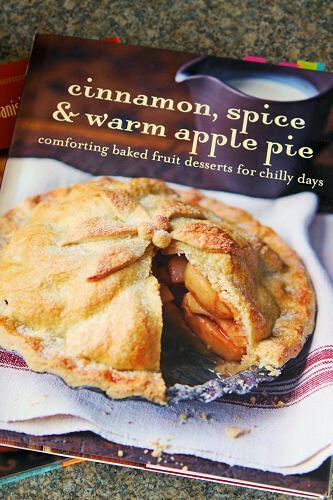 I made two recipes from 'Cinnamon, Spice & Warm Apple Pie', a book with a perfect title for autumn/winter. 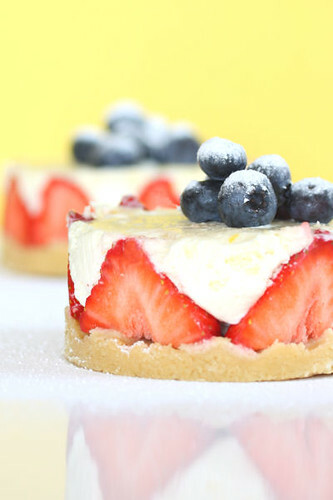 It's filled with the most wonderful warming, old fashioned, simple and delicious desserts. There are chapters on 'crumbles & streusels', 'cobblers', bettys & crisps', 'clafoutis, slumps & puddings', 'pies, tarts & strudels', plus one on 'dessert cakes'. 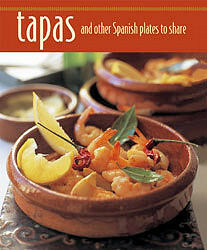 The book has recipes by various well known cookbook authors, including Maxine Clark, Ross Dobson and Fiona Beckett. 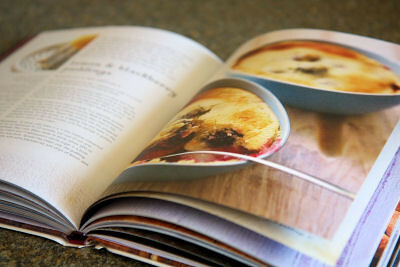 Complete with beautiful photos for each recipe, the book features the 'apple dappy', a traditional pudding from the West Country - made with tart eating apples - it's perfect for the apple glut at this time of year. There's also a 'fig & honey croissant pudding' which only takes a few minutes to assemble before resting and baking. 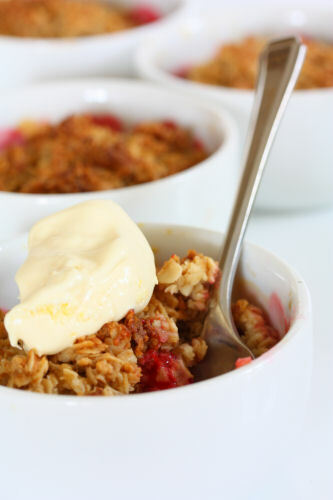 One of the recipes I made was a 'cranachan crumble', a crumble based on that famous Scottish dessert, combining raspberries with toasted oatmeal, whisky, honey and cream. 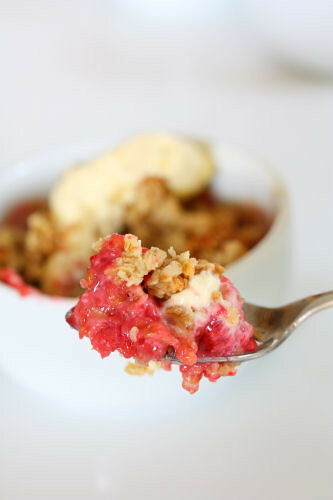 You can use frozen raspberries during the cold winter months and as there's honey and oats in the recipe, it's reasonably healthy for a dessert. Recipe serves 4-6. The recipe says to use a medium ovenproof dish, but I used small ramekins and it worked out very well. Preheat the oven to 190ºC (375ºF) Gas mark 5. Put a baking tray on the middle shelf to heat up. Place the raspberries into a medium ovenproof dish, or divide between 6 ovenproof ramekins. 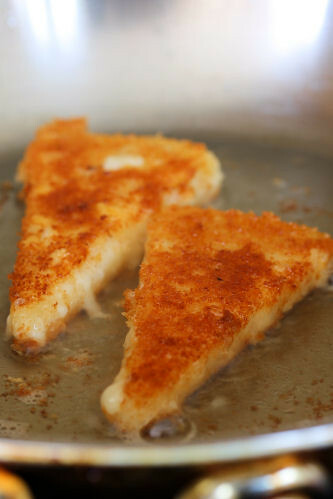 Drizzle with 3 tablespoons of the honey and then pour over the cream and whisky. For the topping, melt the butter and remaining honey (3 tablespoons) in a saucepan and stir in both types of oats, or you can do this in a large glass bowl in the microwave. Evenly spoon the oat mixture over the tops of the raspberries, mounding the oats up towards the centre. 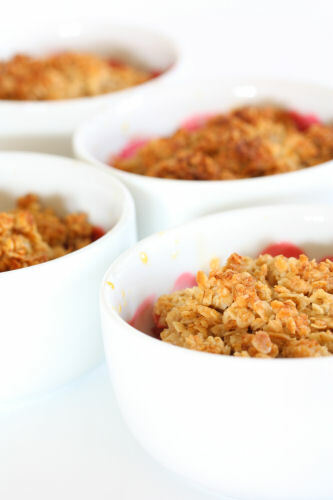 Place the baking dish onto the baking tray in the preheated oven and bake the crumble for about 20-25 minutes, until the top is crisp and golden, and the raspberries are bubbling. Cool for 5 minutes or so before serving with whipped or clotted cream. 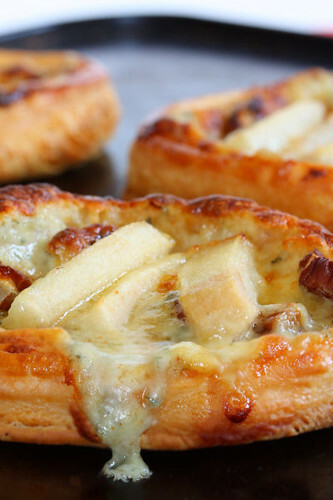 The above tartlet - from the recipe 'pear, gorgonzola & pecan tartlets' by Fiona Beckett - is rather intriguing. You could have the tartlets as an unusual starter, or as a cheese and dessert course rolled into one. 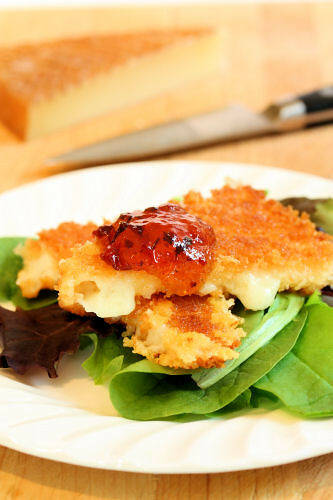 Easy to make, using up seasonal ripe pears, there is a savoury element with the blue cheese and a crunch from pecan halves, all topped off with a drizzle of maple syrup and served warm! Of course, many of the desserts in the book are perfect for the summer months - 'fresh fig & walnut meringue', little raspberry & rose cobblers', 'apricot & almond slump' - all on my list to make! This book would be perfect for someone who prefers fruity desserts and loves to bake. Today is another World Bread Day - the fifth one! I tried to make something different this year, and I was pleasantly surprised with the outcome! 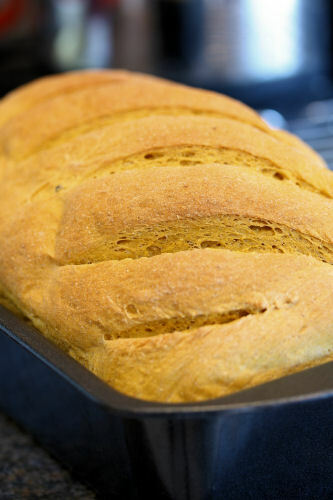 I had searched for 'Pumpkin Bread' online, and most of the recipes were for bread that looked similar in texture to cake, not what I would call true 'bread'. So I fiddled with my regular bread recipe and came up with this version. You can add more spices to your liking, I'm not overly keen on nutmeg or cloves but they would be a good addition if you like them, or you could even add some raisins. 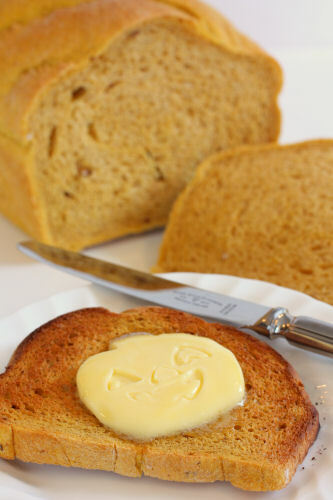 This pumpkin bread made excellent toast! I made the dough in my bread machine, but you could easily knead the bread by hand. 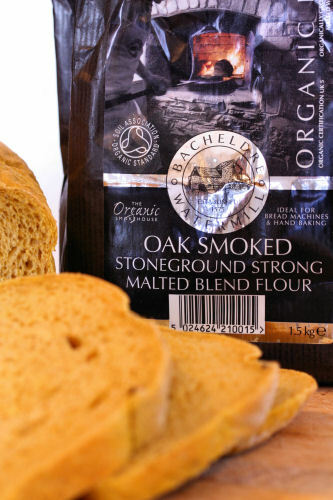 I used some Bacheldre Watermill organic oak smoked, stoneground strong malted blend flour (available from Waitrose) combined with strong white bread flour, but you could substitute whole wheat flour, or make the bread with all white bread flour. I used half a can of pumpkin puree from Waitrose (roughly 225g) and added the water carefully as the dough was mixing. You may need less water, don't just pour it all in at once. Add whatever spices you prefer, nutmeg or cloves for instance. Put the ingredients into your bread machine in the correct order for your machine, when it comes to the water, add it gradually while the machine is mixing. Only add enough to make a smooth soft dough. When the dough is ready, take it out of the machine and put it into a loaf tin, to rise again until doubled in size. Bake in a pre-heated oven 180ºC/350ºF for about 20-25 minutes until golden brown. My bread is off to the World Bread Day round-up, hosted by Zorra at Kochtopf. 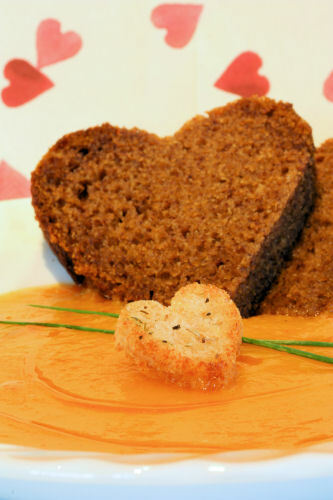 Be sure to check out all the entries and make some bread yourself - how can anyone resist a slice of freshly baked bread! Wow, where has the last year gone to? It seems to have flown by! My eldest son left for his 2nd year of university today, and my younger one is now in the sixth form doing his A levels. Children grow up so fast, before you know it they are off. It made me think that every second we share with our loved ones is precious. Every hug counts. 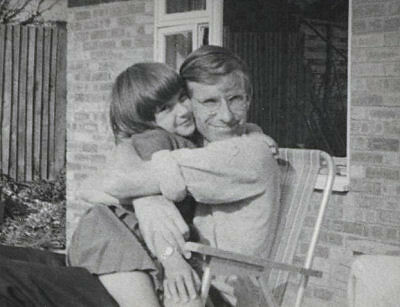 I was in my early twenties when I lost my father to cancer. He was gone within 6 weeks. 6 weeks that went by in a blur. A Taste of Yellow is an event where food bloggers from around the world are invited to contribute a yellow dish, or drink, to raise awareness of cancer issues worldwide. The event is hosted by Barbara of Winos and Foodies, a cancer survivor herself, in support for the Lance Armstrong Foundation. Because of organisations like LiveSTRONG, there are many new drugs and treatments available worldwide, and so much more research is being done to find a cure. 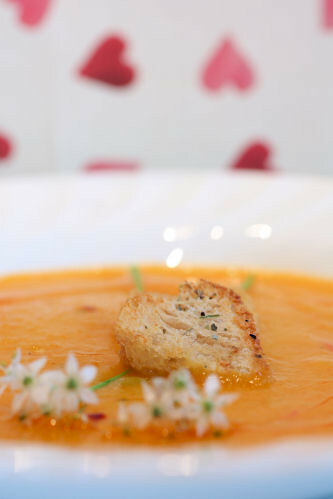 A warming autumnal soup, chillies are optional! Adapted from my mum's vegetable soup recipe. In a large saucepan, heat the oil and butter and start frying the onion. Add the ground cumin, paprika, bay leaves, sprig of rosemary and the red chilli. Stir on a medium heat until the onion has softened, don't let the spices and herbs burn. Add the carrots, butternut squash and potatoes, stir and cook for about 5 minutes. Add enough vegetable stock to cover the vegetables, or use water. Bring up to a boil and then turn the heat down low and simmer for about 45 minutes. Add vegetable stock powder or a cube to taste if you used water. Season with salt and pepper to taste. Remove the bay leaves and sprig of rosemary. 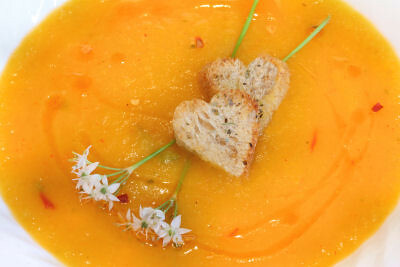 Allow the soup to cool a little before putting it into a blender in batches and blend until there are no lumps. You could use a stick blender if you want. Return the soup to the pan to warm through. Add some more stock if the soup is a little too thick. Garnish with some chilli oil, croutons and chives. 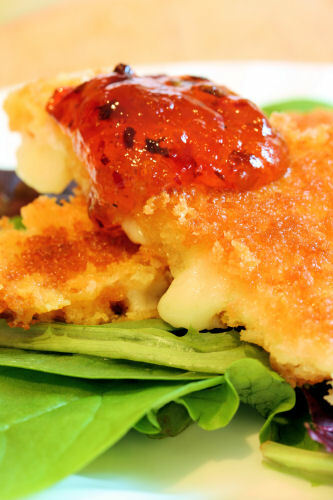 Serve with warm crusty French bread or pumpkin bread.